WASHINGTON (CNN) -- Planners for Iraq reconstruction did not anticipate conditions after the 2003 invasion, setting the scene for lackluster services that still plague the country, according to a report by the Pentagon's inspector. The report, released Thursday, made nine recommendations for improvements for future nation-building plans by the United States. Among the suggestions is for Congress to develop better coordination between the Departments of Defense and State and the U.S. Agency for International Development (USAID), the primary agencies that work with other governments and international agencies. "There is fairly wide agreement that pre-war planning for relief and reconstruction should have been better, and one of the challenges we are seeing in reviewing that is the interagency problem," Special Inspector General Stuart Bowen told reporters Wednesday ahead of the report's release. The efforts of the Defense Department, USAID and the State Department "bumped into each other," causing much of the difficulty, Bowen said. "There was a lack of clarity of roles and responsibility and a lack of effective joint-ness. By that I mean a unity of command, and that needs to be developed before we go to war," he said. The initial plan, the new report says, was for an Office of Reconstruction and Humanitarian Assistance (ORHA) to handle reconstruction efforts. That office's plan, picked up by the Coalition Provisional Authority in April 2003, was for Iraq to "assume complete sovereignty, including full responsibility for relief and reconstruction efforts" within 12 to 18 months of the start of the war. But when events did not pan out as expected in the summer of 2003 -- including the collapse of Iraq's government and the rise of insurgent attacks -- the coalition authority determined that the reconstruction effort "would need to be greatly expanded," the report says. In June 2004 -- when the Iraqi interim government assumed sovereignty -- the State Department-led U.S. Mission-Iraq took over responsibility for reconstruction. "The change to DoS [Department of State] leadership led to another shift in reconstruction emphasis" in which capital infrastructure projects were given less prominence, the report says, with more funding going to the "worsening security situation." "There's fairly universal agreement that the United States government was not well poised to execute the kind of relief and reconstruction operation that was presented in Iraq after the 2003 invasion," Bowen said. Bowen, the special inspector general for Iraq reconstruction, told reporters Wednesday that because of a lack of planning, reconstruction offices did not have the appropriate staff, procedures, systems or institutional strength to direct the interagency rebuilding effort. The report recommends that program managers integrate local populations and practices in every level of planning and execution. "The U.S. government should involve, from the outset, a broad spectrum of individuals with familiarity about the affected nation," the report says. Bowen reported that the United States deployed to Iraq without standardized policies and procedures to manage non-U.S.-appropriated funds. "As a result, there were questions raised about the accountability of those funds," the report says. Bowen did not point fingers at any one person or agency, but he did highlight the confusion between Defense, State and USAID in planning for the reconstruction effort. He put the burden on Congress to develop ways to ensure nation-building efforts in the future are not as uninformed as he describes in his report. "I'm not prescribing a remedy, and that's not my role. My role is to identify challenges," Bowen said. 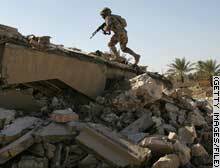 An Iraqi soldier runs atop a destroyed home on the outskirts of Ramadi in January.